Amazing Race 21, "Double Your Money"
The Amazing Race premiere offers so many possibilities for the upcoming season. There are 22 new players to meet and lots of unknown challenges ahead. The potential is exciting, but it can lead to information overload because so much is happening. This isn’t the type of show that takes its time and clearly introduces its cast. Once the action gets rolling, it’s easy to forget which Chippendale spells his name “Jaymes” instead of “James”. This material demands an extended premiere so it can breathe and start on the right foot. Showcasing Phil’s introduction, 11 teams, and a complete leg in the regular hour is difficult. Even a fast-paced show like The Amazing Race needs time to gets its footing. While the time frame is difficult, the opener still includes plenty of entertaining moments. 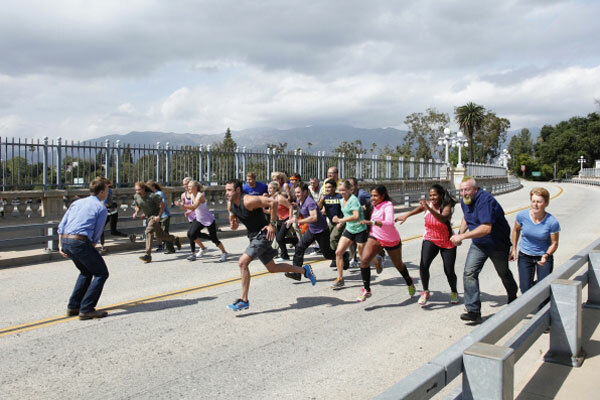 Phil gives his speech from the top of Pasadena’s Colorado Bridge, and teams must immediately rappel down 10 stories. Their first destination is Shanghai to play ping pong, eat the Fallopian tubes of a frog, and scramble to stay around. For more details, check out my review for Sound on Sight. Phil gives one of the strangest introductions in the show's long history. He appears at a different location, and his speech is edited strangely and feels truncated in a weird way. This is likely a result of the one-hour running time, which makes everything move too quickly. Josh and Brent are goat farmers who commute to the city for their regular jobs. They seem like interesting guys, but they are arguably the most irritating team this week. They spend much of the leg in last but recover nicely at the abacus to finish seventh. I'm hoping they'll find their bearings as the race moves forward. I have mixed feelings about the eating challenges that have become even more common lately. They can deliver great drama as teams struggle, but it can be nasty. The hasma wasn't one of the harder tasks, but it wasn't pretty. Although they survive in the end, Jaymes and James commit the worst type of mistake when you're struggling on the race. They stand motionless and don't try to make anything happen. The teams that thrive are those who work incessantly by talking with locals to find the clue. Their strength may keep them around for a little while, but these guys don't seem like true contenders.